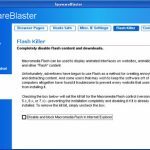 SpywareBlaster is an effective security tool designed to prevent the installation of spyware, adware and unsolicited potentially harmful software. This program is not an actual spyware remover, as it does not scan the system for parasites and even does not remove them. 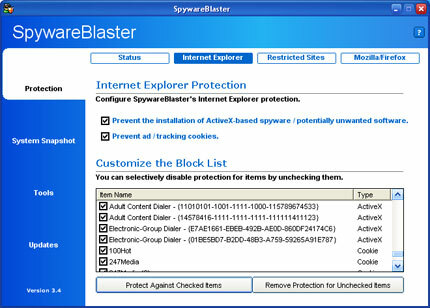 In place of it, SpywareBlaster uses another approach to secure the system and protect user privacy. Most parasites secretly get into the system through drive-by downloads, malicious pop-up advertisements or from insecure web sites. SpywareBlaster is designed to add extra defence features to one of the most weakest chains in system security – the web browser. The application installs special registry keys called killbits, which prevent the installation of thousands of ActiveX-based parasites. It blocks tracking and advertising cookies that can be received using Internet Explorer, Mozilla Suite or Mozilla Firefox browsers. 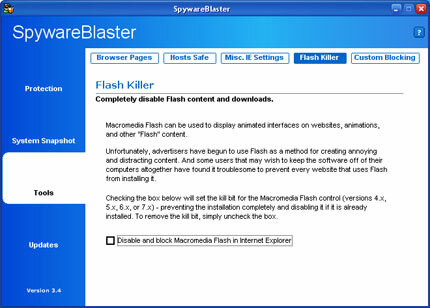 SpywareBlaster can also be used to restrict harmful actions of potentially dangerous web sites. In simple phrase, the program allows the user to safely browse the Internet including most malicious resources, even those that attempt to automatically install spyware and adware threats. 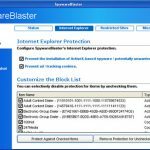 SpywareBlaster includes additional tools that allow to restore safe web browser settings, backup the Hosts file and create a snapshot of essential web browser and system settings. It also offers the Flash Killer utility, which completely disables Flash animations widely used by dishonest advertisers. 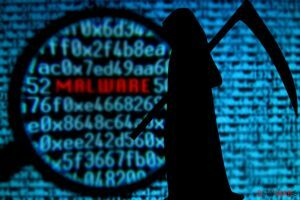 SpywareBlaster protection is based on the extensive malware definitions database that is updated on a regular basis. 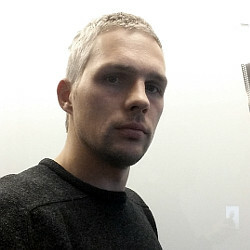 The application does not have to remain running in the background. It should be started only to update the database and change its settings. The program’s interface is clean, attractive and very user-friendly. 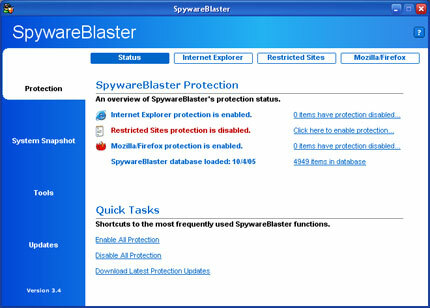 SpywareBlaster is free for personal and educational use. Business users are encouraged to purchase an AutoUpdate subscription. The official web site is www.javacoolsoftware.com. This entry was posted on 2014-05-10 at 03:42 and is filed under Anti-Spyware, Software.